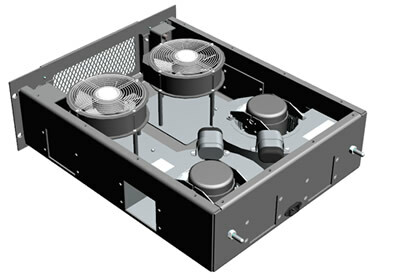 For high heat loads, the circulating fans built into electronic equipment may not move sufficient air volume to effectively cool the enclosure. In that case, a separate blower drawer, fan assembly, or combination of blowers and fans, may be required to substantially boost air circulation for optimal cooling. Available in multiple configurations — Electromet offers two general types of blower drawers, a standard configuration that readily mounts into any standard 19-inch (EIA) COTS electronic cabinet and a custom configuration that mounts only into an Electromet, Heavy-Duty “CY” cabinet. 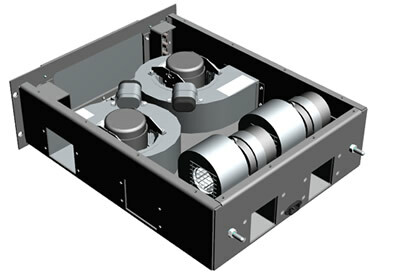 Standard Configuration — We offer a selection of blower/fan and discharge combinations (side, rear, top) to allow customers to select the discharge solution that best meets their needs. All blowers use MIL-B-23071 compliant motors and incorporate proprietary designs that give them an extremely long service life (~30 years). 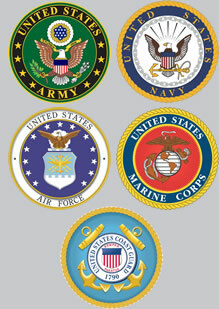 They include enclosed lubricated bearings making them significantly quieter than comparable alternatives. 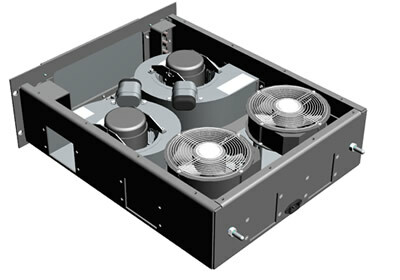 We have the capacity to vary motor speed to balance both air flow and noise considerations and can achieve 48 db for a 4-motor blower drawer in some cases. 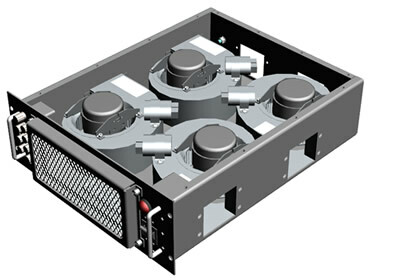 Custom Configuration — Optimized for use in our custom, Heavy-Duty “CY” cabinet, these blower drawers come in a Full-Speed version and a Half-Speed version. 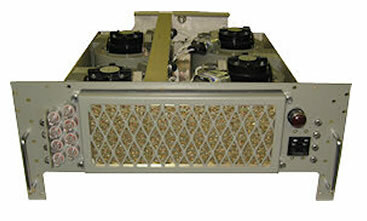 Both are constructed using four (4) motor/fan assemblies mounted horizontally in parallel, with air discharged to the sides of the cabinet, where it is carried up vertical side-wall air plenums and ported directly onto hot components.